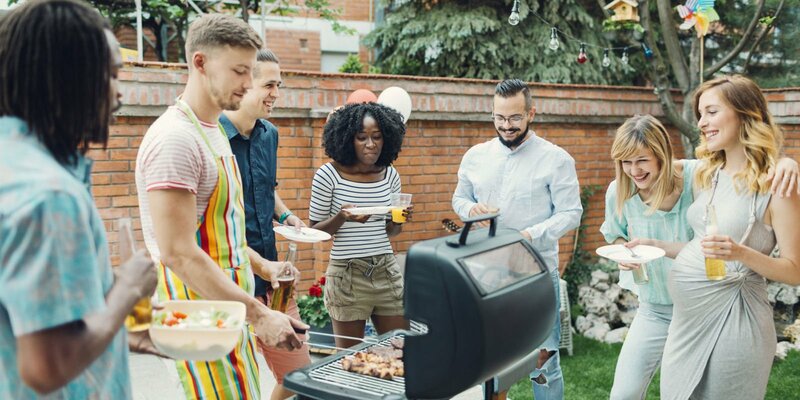 If you like hosting outdoor gatherings on a frequent basis, you are sure to know the significance of having the right type of grill. With the right portable grill, you can easily have the best grilled food on the go. Portable grills are designed with pretty good specs that are similar to the standard grill models but with a more compact design for easy portability. And the price is economical too. But the compact size and low price does not mean that you have to compromise on the quality of the product. Regardless of the type of food you like including seasoned vegetables, hot dogs or juicy burgers, you can now easily find a suitable grill that satisfies your every need in a portable grill model. Below we’ve listed and reviewed the 10 best portable grills you can currently purchase online. Whether you are camping, tailgating or barbecuing, a grill is a vital addition that you cannot do without. Coleman is a name that has gained a reputation for providing the best quality grills for over 17 years. The Road Trip Grill from Coleman is nearly as good as its full-sized backyard counterpart. The Road Trip Coleman grill has a stand with wheels for easy maneuverability. It can be folded flat allowing you to carry it in your trunk easily. And you need not worry about the lid taking up much space as it is designed with a very low profile. Here are a few of the important features of Coleman 9949-750 grill. The standard backyard grills are monstrosities that make you avoid using them whenever you can. However the portable grill from Coleman is a wonderful exception. You can carry it around easily and installation is not much of a hassle either. You need to just fold the grill, roll it over to the spot where you want to cook and set the grill in just a few seconds with its easy lift-lock method. The two side tables help in hassle-free cooking. Coleman propane portable grill does its job efficiently. You need to just press a button and the lighting system, which is named Instastart lighting system, is activated without having to use a match to light it. The grill has two separate adjustable burners using which you can maintain precise control of the heating temperature. The cooking surface is 285 square inches on which you can cook for over an hour using a 20,000 BTU powered propane cylinder. The grill is easy to clean with its porcelain coating and the grease tray is removable making cleaning a breeze. It is important for portable grills to be convenient to use otherwise they can turn your favorite barbeque into a nightmare. The Smokey from Weber is made of porcelain coating for easy cooking without seasoning. The handle, made of nylon reinforced with glass, helps to remove the lid whenever you need without having to use mitts. The product weighs around 10 pounds so it is easy to carry around whenever you are camping or traveling. The dimensions of the product include 15.6 inches x 15.6 inchesx9 inches. The product has a warranty period of 10 years, so there are no worries about damaging it or of any defects present. The grill has a grate of 141/2 inch diameter that is ideal for cooking three steaks or 6 burgers in a single go. The bowl and lid are made of porcelain coating which ensures they resist rust formation and distribute heat evenly. The grill comes with adjustable dampers made of aluminum present in the bottom and top for regulation of air flow. There are 4 vents in each part. The grill includes a charcoal grate made of steel and an ash catcher made of aluminum. The package comes with all hardware you need to set it up. The compact grill has a sufficiently large grate for grilling. The vents ensure there are no flare-ups and make the cooking process efficient. The top quality patented chimney starter ensures the coals are lighted easily and without much difficulty. The cooking guide provided with the product has cooking tips and recipes to make even a newbie excel at making tasty grilled foods. One of the important things to consider in a smoker grill is how easy the equipment is to clean and maintain. Weber Smokey has plenty of features to make it easy on the cleaning and maintenance chores. The ash catcher helps cleaning simpler by catching all the ash without spreading it all over. You can empty the ashes once you have finished grilling. The compact size and porcelain coating ensure cleaning is not a hardship. The entire grill is made of stainless steel giving it a stylish and sleek look. The stainless steel also makes it rust free and very convenient to clean. The material also makes the grill very light to carry making it an ideal portable grill. When folded it appears similar to a briefcase. The lid is double walled ensuring heat retention and extra insulation. The other parts of the grill include a grease tray, temperature gauge of commercial grade inbuilt on the lid and a hood that latches onto the bottom and easy to fold legs for hassle-free portability. The dimensions of the grill include 15.8 inches x 26.9 inches x 11.8 inches and it weighs 20.2 pounds. The grill reaches its optimal temperature of 500 degrees Fahrenheit in just 5 minutes, so cooking meat and burgers are faster and efficient. The single burner in the grill can give a power of about 12,000 BTUs. The grill with dimensions of 18.5 inches x 11.25 inches is capable of fitting about 8 hamburger patties. The flavorizer bar prevents any flare-ups by its placement between the burner and grill grate. 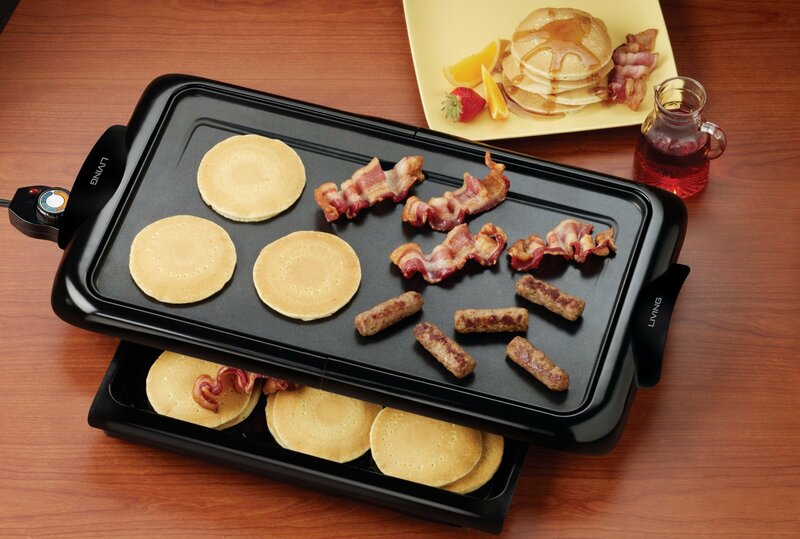 The warming rack ensures cooked food is warmed and ready to eat while you grill more food. Smoke Hollow 205 is light in weight making it ideal for cooking on the move. The set up is very easy taking only a few seconds. Once you have finished cooking, it is as easy to clean and pack up. The legs are designed to fold inward with the hinge type joints. The hood of the grill latches onto the base with two latches that secure the grill firmly. The handle is large and comfortable to use. The stainless steel design makes it easy to clean. You need to use a cloth dipped in soapy water and a c scraper made of plastic for cleaning the interior and exterior thoroughly. The cleaning is easier when the grill is a bit warm. The grease collecting drip tray present in the bottom can be removed and cleaned. The grill grate needs special attention. You can use baking soda to remove the grease sticking to the grate. Flavoriser or flavor activator is a very thin metal strip with sharp edges that can harm you. Weber grills are popular for their stylish and premium range designs. Q1000 stays true to Weber tradition with its improved look. The dimensions of this model are bigger and include 20.5 inches x 27 inches x 23.5 inches making it bigger in size than Q100 model. The bigger sized knobs and handles ensure handling is easier. The grill weighs 28 pounds making it easy to carry while traveling. The cooking grates are made of cast iron with porcelain cover. The lid is made of cast aluminum. The electronic ignition makes it convenient and safe to light the grill instead of using matches. The heating surface is designed well-ensuring heat spreads evenly throughout the grill. So you will not have to worry about undercooked or overcooked food. The cooking surface is about 189 square feet ensuring you have ample space to cook about 6 steaks. The single burner may restrict the quantity of food you cook, but the grill heats up quickly and evenly making it ideal for barbecues. Since the grill takes minimal space it can also be used indoors in your kitchen. The design of Weber Q1000 aims at providing convenient grilling experience. The control knobs and handle are ergonomically designed making it easy to control the heat and handle the grill deftly. The red power button is of push type to switch on the unit easily. The construction is of high quality and is free of corrosion and rust. Cleaning it is easier with the porcelain coating in the grates. The grate is a two-piece design enabling easy cleaning after cooking. The frame has inbuilt handles making it convenient to carry the grill wherever you need it. The Weber Q1000 is a stylish and lightweight grill you would be proud to own. Other than minor hitches like the 8500 BTU burner, the grill can serve as your best portable grill with its excellent features. The standard Char Broil grill is made of high-quality stainless steel with a high-temperature capacity and durable finish that extends the grilling life and prevents rust formation. The grill is compact with dimensions of 24 inches x 12 inches x15 inches and weighs 10.2 pounds. The grate area is 187 sq. inch and is made of chrome plated material. The legs are of a foldable type and help in providing a secure locking system when the grill is not used. The legs stretch down to form a stand when you use the grill. The lid and steel body have porcelain covering for easy maintenance and stylish look. Since the grill weighs just 10.2 pounds you can easily carry it around and the locking mechanism of the legs in the grill ensure it is well protected. The compact dimensions make it easy to store in your camping or RV unit. The portable grill from Char Broil is ideal if you need low temperature for cooking with the grill covered by the lid. The grill temperature is sufficient to cook hot dogs, fish, chicken, and hamburgers. But the temperature is not ideal for high-temperature grilling such as steaks. The lid when opened acts as windbreaker retaining the heat in the grill. While the warm-up time in nearly 10 minutes, once warmed it can cook evenly because of the straight burner. The grate can easily cook about 6 to 8 hamburgers. The grill, however, uses more amount of gas, which makes it necessary to have additional propane backup when you are camping or go for a regulator and universal hose to upgrade the propane source as a refillable form. The porcelain coating makes cleaning easier. You need to clean the grill when it is warm using soap water. The absence of grease tray makes one item less for you to clean but the drain holes present in the base of the grill collect the grease and you have to use foil to prevent the grease from staining the surface you keep it on. The coating remains safe when you use nylon brushes and mild abrasive pads. The guard for the burner is very sharp and thin so you need to take necessary precautions before you start cleaning. Since the grill is dishwasher safe, you can also clean it in the dishwasher without any hassle. The handle is made of plastic which heats up fast so you need mitts to lift the lid. Cuisinart CGG-180T Petit Gourmet Portable grill is a compact grill that has everything you look for in a portable grill from compact size to proper control of temperature. It can easily be carried around to the park, camping outdoors and even in your own backyard. Here are some of the important features of the Cuisinart CGG portable grill. The 180T grill from Cuisinart contains a folding base table and is of briefcase style with the typical handle for easy carrying. The legs are made of sturdy aluminum and have stabilizing feet. There are two aluminum leg sets with a base table that can be folded easily when you finish cooking and pack it up. The Cuisinart portable grill made of porcelain covered grate has a grilling area of 145 square inch which can easily accommodate 6 steaks, 8 burgers, about 4 pounds of fish and 8 -10 pieces of chicken breast. The burner is made of stainless steel and has 5,500 BTU power. The grill in spite of being smaller in size can work as efficiently as a standard sized larger grill. The propane fueled grill can reach a high temperature of 400 degrees Fahrenheit, which is apt for searing steaks whether it is medium rare or medium cooked you prefer. The Cuisinart grill with dimensions of 16 inches x 16.5 inches x 13 inches and weight of 2.2 pounds is compact enough to carry around anywhere you want to have grilled food including your favorite game, campsite, beach and other places. The lid latch, folding legs, ergonomic carry handle and drip tray with excellent spill resistance are convenient features that boost portability. The ignition is of twist start type ensuring easy lighting. The Cuisinart grill is made of high quality material with porcelain covering ensuring easy cleaning and extended durability. The grate is easy to remove and is dishwasher safe. Manual provided with the product includes cleaning and maintenance instructions and tips. Not ideal for large groups and suitable for a maximum of 4 people. Lodge L410 portable charcoal grill is a sturdy design made of high quality cast iron. The grilling surface has dimensions of 17.2 inches x 9 inches, while the grill unit has dimensions of 19 inches x 10.2 inches x 8.2 inches. The grill grate can be placed in two different heights for temperature regulation. The flip down door helps to access coal. The cast iron Lodge grill is ideal for use in patio or backyard barbecues. It is sufficiently durable to withstand use while you go on fishing or camping trips. The grill grate surface can easily accommodate sufficient number of burgers, steaks or whole fish for a quite small gathering. The draft door of flip down type helps in heat regulation. You can also heat or warm tea or coffee in the grill other than the usual grilling. The grill also has another door with sunrise marsh décor for easy coal access. The grill has a few good convenience oriented features including an ergonomic handle for easy carrying and an inbuilt shelf to rest utensils while cooking food. The compact size makes it ideal for storing in your closet or any other limited space, when it is not in use. For people without sufficient garage space, small yards or apartment dwellers the small size is a great advantage. Since the grill is made of cast iron, it is prone to rusting. Although the grate is durable and of good quality, you need to properly maintain it for extending the life of the grill. To prevent degradation and rusting, you need to clean the grates consistently every time after you use it. And when it is not in use, keep it well-oiled to prevent rusting. While the Lodge L410 does not score points in portability, its high functionality and sturdy construction with draft door integration makes it a reliable and durable product worth the price it is available at. If you love the flavor of meat and vegetables cooked over a charcoal grill, the Weber Go Anywhere grill may be the right fit for you. The grill is designed to provide a satisfying and unique cooking experience. The charcoal grill is compact enough to carry anywhere and set up is also easy. The low price tag makes it a hot favorite for grilled food fans. Here is a closer look at the features of this unique grill from Weber. The Weber Charcoal Go Anywhere grill has pretty much the same design as the earlier models from Weber. Few exceptions include the handle made of nylon reinforced with glass and the porcelain coating that avoids rust and enables easy grilling. The grill has 2 dampers that can be adjusted to regulate air flow. Each damper has 3 vents. The dimensions of the charcoal grill include 12.2 inches in length x 21 inches width x 14.5 inches height and it weighs 14.5 pounds. The compact grill is easy to set up and handle. The assembly of the unit takes just a few minutes and you are all set to cooking your favorite item wherever you go be it tailgating, picnicking in the park, beach or camping. The grill has a good seal and closes completely retaining all the drippings and ashes in. This prevents any leakage of stuff on your car. The lid locks into place courtesy of the pivot legs. The lightweight further helps you to carry it single-handedly wherever you go. The grill has a heating surface of 160 square inches and heats up fast. And it fits about 6 burger patties. Offset grilling is also possible with this grill. The air vents provide sufficient airflow and you can adjust them to regulate the temperature inside the grill. The inbuilt hangers make it easy for the lid to rest on one side acting as a good barrier from the wind. The grate with triple coating of nickel and steel is very easy to clean. The lid with porcelain enamel covering and the grilling box are made of durable material that lasts for a long span. The coating keeps the grill free from rust and corrosion. The simple design makes it stress-free to keep the grill grates clean. Grilling over heated coal gives food a special aroma that is incomparable. The taste and flavor linger long after you have sampled the food. With a reputed griller like the Cuisinart portable gas grill, you can have aromatic and flavorful grilled food every single day. The grill can also be used indoors with even heat distribution and precisely controlled temperature. The advantage with this type of charcoal grill is that you need not have charcoal and there is no necessity to deal with ash. Smoke is absent and the temperature is easy to regulate. Here are a few important features of the Cuisinart CGG portable outdoor tabletop. The Cuisinart 200B grill contains special surfaces for grilling that are interchangeable. The panels have specially designed edges for a perfect fit. You can interchange the grill surfaces and cleaning and storing is also easier. The grill unit dimensions include 19 4/5 inches x 274/5 inches x 124/5 inches. The unit has side shelves that are foldable when not in use. The other parts of the design include a temperature gauge and ignition knob that is of twist start type. Grill lid is made of stainless steel of 430grade. The double walled design ensures heat is retained and there is minimal heat loss. It also ensures even distribution of heat in the grill. The unique loop burner made of stainless steel has 12,000BTU power that helps heat up the grates quickly. You can effectively grill steak, roasts, hamburgers, fish and chicken. The separate veggie panel which is ideal for use at low temperature helps to grill sandwiches, pizzas, veggies and other foods. The grill has the capacity to achieve a temperature of 500 degrees Fahrenheit quickly. The grilling surface is 240 square inches and can easily cook for a large group of 8 people. The cast iron construction ensures the grill heats up evenly. The porcelain enamel covered cast iron grate makes it easy to grill food without worries about rust or corrosion or clean up hassle. The drip tray, which has dimensions of 19.8 x 27.8 x 12.8 inches helps to catch all the grease without spilling over. The two sides of the grill grate can be used to cook different types of food. For grilling chops, poultry and steak the side with maximum contact is ideal, while the other grate side is perfect for cooking seafood and fish. The side tray helps hold grilling accessories, spices, condiments, plates etc. Design is very versatile allowing cooking all types of food. The Char Broil Grill2Go portable grill uses the TRU-Infrared design, which helps create the perfect temperature for searing food without any flare-ups and the cooked food retains its moisture content. The portable grill is light in weight, durable and simple in design. If you are looking for a small sized grill for use in your patio, this may be the right choice for you. Here are some of the important features of the Char Broil Grill2Go. The grates and burner in the Char Broil portable grill are made of top quality stainless steel. The lid is made of aluminum. The grill has carry handles and legs for stability while in use. The dimensions of the grill include 23.7 inches width x 15.7 inches length x 13.6 inches in height and weighs 20 pounds. The entire construction is aimed at making the grill suitable for rugged conditions you may use it in including tailgating or camping. The Grill2Go from Char Broil is very convenient to handle due to its simple design. The large handle enables easy opening and closing and packing up is also hassle free due to the secure locking mechanism. The handles are cool to touch and heat resistant. The ignition is of push button type, which is easy to operate and it does not need batteries for working. The grill grate has a cooking surface of 200 square inches allowing you to grill any type of food including hot dogs and burgers easily. The 9,500 BTU powered grill can heat up very quickly so grilling meat, vegetables and sandwiches is a breeze. The TRU infrared technology helps generate a minimum infrared head of 65 percent. The heat spreads evenly due to the efficient construction of the grill. The heat is even ensuring food retains moisture and does not dry up. The heating temperature ranges from high sear temperatures to low simmer temperatures. In contrast to the conventional gas grills where convective heat is used, infrared heat penetrates food and helps lock the flavor and juices in the food without letting it to dry. The infra-red heating also eliminates flare-ups. Made of die cast material, the Char Broil Grill2Go has a porcelain finish that extends grill life. The grate is made of stainless steel, which does not rust or corrode easily. The infrared system enables cooking even in the coldest weather and the unit can also be converted for pairing with a gas tank weighing 20 pounds. Since the unit heats up fast, it retains high temperature for a long time making it difficult to cook items like veggies and fish, which need low temperature. Portable grill is a favorite choice for those who want to host frequent barbecue parties on the go at the beach, camping site, tailgating and more. A portable unit allows them to pack up and go whenever they want. Not only do people on the move find the portable unit handy but also people with limited space like a small patio or balcony would find the compact grill ideal for their barbecue needs. Portable grills are small to allow easy carrying and storage. Propane tanks are available in many home renovation and hardware stores and in gas stations. They are available as 16.4oz and 14.1oz grills. For tanks with larger capacity, an adaptor hose is provided that connects the grill unit to the tank placed on the ground. Although propane is a cheap source for fuel, a small tank provides poor fuel economy. Other types of portable grills include electric and charcoal grills. The grills heat up very quickly. You don’t need to look for an outlet in case of the charcoal grill as in the electric model. Since you are looking for a portable unit, the size plays a vital role. You need to consider the space you have for storage and when you are on the move. Decide whether you intend to use in at home in your patio or backyard or taking it along when you are camping, tailgating, fishing etc. Other than the space for the grill, you have to consider the propane tank too. You get portable grills in a diverse variety of sizes and shapes including rectangular, flat, barrel shaped or like a regular stovetop pot. Make sure you measure the space present and choose an appropriate unit. The space available for cooking or the grate space is another important criterion. The portable models in the market generally have cooking area that range from 150 square inches to 250 square inches. The smaller models can easily handle about four burgers with space of about two inches around the patties. Larger ones can cook 6-8 burgers. If you are using the grill regularly and for larger number of people, the larger grill models would be ideal for you. The portable grill units have a weight range that starts from 10 pounds to as high as 35 pounds. Too much of weight can make portability difficult. You need to think about carrying it from the storage space in your home to your car and to the picnic table and repeat the process. Remember that the weight and size do not always correspond. You may get a light weight model with more space too. Therefore do the required research, so you have a truly portable grill that is convenient over the long term. If you want the portable grill you buy to last and give the same stellar performance for years to come, you need to buy one that is sturdily constructed. Cast iron is ideal but since it is heavier you can opt for cast aluminum, which a good alternative. But thin steel grills with enamel coating can affect the cooking quality. A complicated design with sharp corners or unnecessary grooves and edges can make your cleaning a nightmare. Instead opt for simple and smooth lines or dome shaped grills that make cleaning a breeze. And drip trays or pans are a must, if you want a hassle free grilling time. A higher BTU will make it easy to heat the grill faster and cook food quicker. Since portable models have only limited cooking space, you need not have the same BTUs as in the standard sized models. The optimum range is from 8000 BTUs to less than 20,000 BTUs. Many grilling enthusiasts prefer charcoal while there are others who swear by gas grills. Each model has its own benefits and drawbacks. Charcoal is a hot favorite for those who love barbecue the good old way. And the fuel burns much hotter when compared to propane powered grills thereby producing more sear. But the drawbacks like too heavy to use, messy grilling and longer time taken to temperature reach the optimum level will want you to reconsider your decision. As for the propane grills, the grates get heated up quickly and cleanup is quite easy. But the only thing that a propane grill lacks is the charcoal flavor that you associate with grilled foods. And the gas grills are expensive than the charcoal models. Now that you have gone through our list of 10 best portable grills and the buying guide, you are sure to find a portable unit that suits your budget, lifestyle and specific needs. When you choose a reliable, safe performing and quality grill, you will have a great time hosting your barbecue parties delivering mouthwatering food every single time. Whether you prefer the gas grills or want the flavor dominant charcoal models, our review will give you the right perspective and make you decide on the portable grill that provides the best value for your money.